I love pickles, but I prefer them crisp and crunchy, bright and beautiful. They are a nice accompaniment to a sandwich in lieu of chips, or as a tangy little something mixed in with the other doodads on the hors d’oeuvre tray. Most pickle recipes require whatever you are pickling to sit in the brine for weeks. These can be eaten in a matter of hours, though I would recommend leaving them to brine overnight. But they are best when fresh. The longer they sit in the brine the softer they will get. 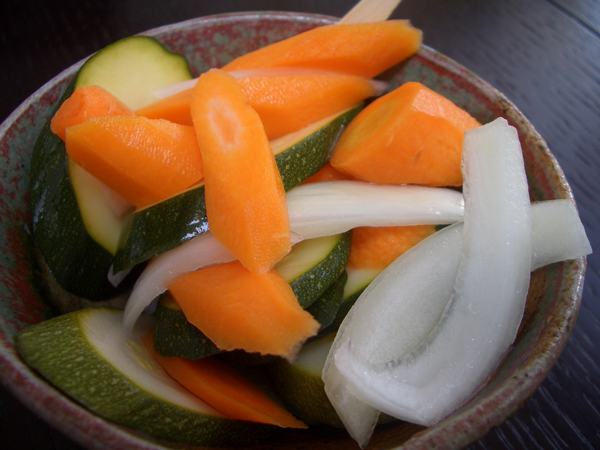 In a bowl, toss the vegetables with the salt and let sit for 5 minutes. Rinse and drain the vegetables. Combine the sugar and water, stirring until the sugar dissolves. Add the vinegar. Let the brine cool completely. Put the vegetables in a non-reactive container (stainless steel or glass)–I use a canning jar–and add the brine. 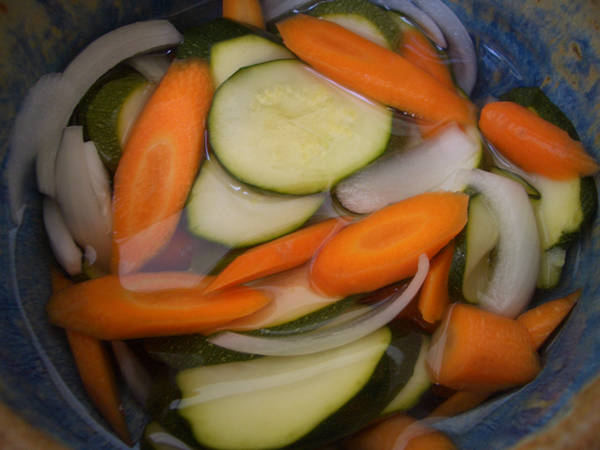 The brine should cover the vegetables completely. Cover the container with a lid or plastic wrap and refrigerate until ready to use. The pickles should last for several weeks.